And then? Then things got a little ugly, for various reasons. One big red flag I came across was the revelation that this trilogy wasn’t planned out in advance. Now, there’s a lot to say for incorporating flexibility into an ongoing story – hell, I can relate, seeing how I’m writing a historical fiction project spanning from 1805 to 1950-ish – with a scope like that, I think some wiggle room is a necessity. Still, I would feel a lot more confident about all of this if they had some semblance of guide posts, notes they want to hit in the second and third installments in this trilogy. That way, pacing can be managed properly, and we wouldn’t be in as much danger of padding in one movie and rushing the other. There’s also the much-publicized remarks by Mark Hamill about his “fundamental disagreement” with how the writers intend to handle the character of Luke Skywalker. Now, Hamill’s criticism was measured, and he emphasized that, having voiced his misgivings, his priority was then to see the director’s vision through to the best of his abilities. Still, that’s not a reassuring sign. And of course, there’s also the tragic passing of Carrie Fisher late last year, which no doubt threw another wrench into whatever semblance of a plan exists at Disney right now. With all of that said, initial reviews for this movie seem quite positive, and I fully intended to watch the film regardless, so I got to a theater on Saturday night and gave it a watch. What did I find? Well, it’s an odd film. The Last Jedi seems to take a perverse sort of delight in messing with your expectations. I will say that it’s good, but I also feel like it shows some strain in the way it presents the story, and I retain my misgivings about us limping into the final installment. Now, the last time I reviewed a movie, I decided to be circumspect enough about specific events that a spoiler warning didn’t seem necessary. I don’t think I can maintain that same level of restraint for this one, so I’ll adopt a hybrid approach of sorts. I’m not going to spoil things unnecessarily, but I won’t let fear of spoilers deter me from expressing my thoughts as directly as I can. So, consider this my warning. Now, the first thing that occurs to me here is that in the age of the internet, filmmakers have maybe become too receptive to criticism. I first got this feeling with Batman vs. Superman last year, where they heard all the griping about Superman’s fight with General Zod causing so much death and destruction in Metropolis, and simply used it as a pretext to incorporate even more angst into his character. Likewise, for this movie, you can tell that they heard the criticism that The Force Awakens took too many cues from A New Hope, and went out of their way to create an unpredictable, swerving storyline. Now, I’m not too displeased with the results in this case, but it still rubs me the wrong way when a sequel tries so hard to appease the peanut gallery like this. It comes across like a lack of faith in their creative vision, and in this case, must have been a far more involved bit of rewriting than in Batman vs. Superman’s case. Now, I’d say there were two ways they went out of their way to dodge the charge that Episode VIII would reprise Empire Strikes Back. The first involves their use of set pieces. Just like in Empire Strikes Back, we see the First Order’s fleet attacking the Resistance just as they’re evacuating a base. But instead of providing a Hoth retread ground battle right away, we instead get a space battle. And in case you were worried that things might get a little to intense, not ten minutes in, we have Poe, the ace pilot from the last movie, start trolling General Hux about his mother to stall for time. Yeah, that’s the other thing. This is a silly movie, possibly the silliest Star Wars movie ever made, Holiday Special notwithstanding. And from where I’m standing, this is no criticism, largely because the jokes are so rarely the kind of cheap slapstick or scatological humor you’d get in a lesser movie. No, the humor is actually quite on point, breaking up tense moments and puncturing the haughtiness or self-seriousness of certain characters. And yes, that definitely includes Luke Skywalker. I’ll get back to him in a bit more detail later, but suffice to say, the dialogue and comedic timing are sharp as hell in this film, possibly to a fault. Now, when I say that the film may be too sharp, I’m primarily thinking of some of these set pieces they set up. Honestly, it felt like there were too many in this movie, and too many scenes where they dropped a bunch of exposition to lay out the parameters of a set piece. Worse, I feel like the level of detail they used raised further questions. The Resistance fleet gets chased down by the First Order for most of the movie, without catching a break. This is a new development, and they repeatedly tell us how long it’ll be until the rebel ships run out of fuel and get vaporized. This is kind of a problem for me, since two groups of protagonists have to run off to other planets and back during this time frame that’s explicitly measured in hours. Honestly, I’m not sure how displeased or skeptical I should be about this, but it seems to tell you that a ship can go halfway across the galaxy in six hours or less, and I don’t think I like the implications of that. It seems like it would have been a wiser move to break up the chase somehow, or throw a little more ambiguity regarding timing into the mix here. The way things are, it seems like it closes off certain other narrative possibilities by making the timing of the scenario so explicit. It just feels like a lack of foresight in terms of what future situations might require to be compelling. Now, before this review gets too negative, I should emphasize other things that do work about this movie. Like I said, the dialogue and timing are quite sharp, and as much credit as the script deserves for this (compare to the Prequels), I should also praise the actors. I don’t feel like he necessarily gets as much praise for the original trilogy as he deserves, but Mark Hamill reminds you just how good an actor he is here. It’s amazing just how much he can poke holes in other people’s egos, particularly Kylo Ren at the climax, while also being vulnerable to the same treatment from Yoda, who makes an appearance (with a puppet, no less! ), voiced by Frank Oz and all. Carrie Fisher also does well, although I’ll admit, having Leia spend a good chunk of the film on life support is uncomfortably meta. And the new cast are also quite effective, despite the fact that the big three new kids spend most of the film separated. 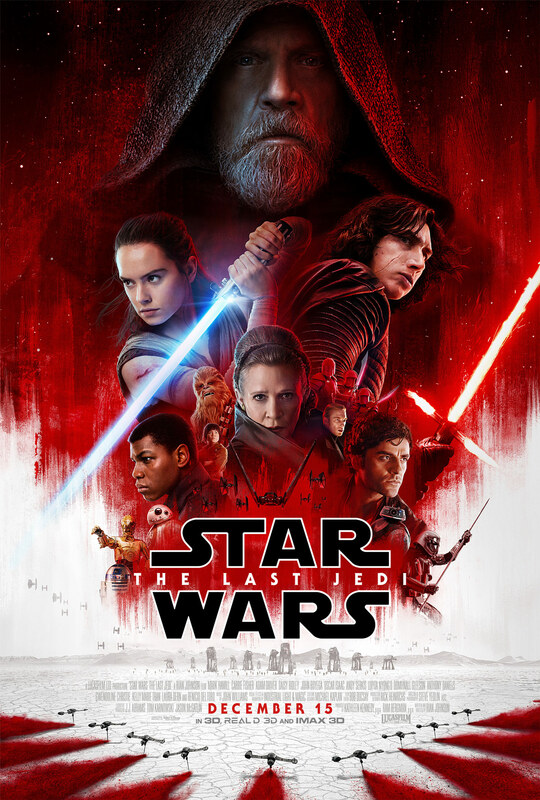 Poe learns that there’s a big gulf between being an effective solo tactician and a leader of a movement, Finn grapples with questions of loyalty a bit, and Rey learns that just because someone can be saved, doesn’t mean they want to be. And for the biggest spoiler yet, Kylo Ren kills Snoke and takes over the First Order here. I’m not too surprised – certainly, when we have those two and Rey in a room together a film earlier than you’d expect, I couldn’t see any other way out of it. What it does mean, however, is that Snoke himself wasn’t too important, except as a way to put Ben Solo onto the wrong path. I’m not sure how much I approve of this, for a couple reasons. First, Kylo isn’t a character whose most obvious trait is how intimidating he is. Vader had presence, so even if the stunts Ren pulls are more technically impressive, it’s still more obvious to the audience how pathetic (in the classical sense) his character is. And also unlike Vader, Ren doesn’t come across as particularly clever. Second, Snoke seemed to have a unique outlook on the Force, that was different from both the Jedi and from Palpatine and other Sith. I’d hoped we’d hear more, and maybe get some interesting comparisons between his ideals and Luke’s in this movie, as both seemed to want to move on from Jedi traditions. Kylo’s understanding seems more shallow; if anything, he’s just a corruption of the Jedi fear of attachments. It seems like he’s loyal to the First Order now only because it’s different, somehow, but he doesn’t articulate why. We’ll probably explore his motivations in more detail in the next movie, but I’m not sure how interesting it’ll be. So although this review has dwelt more on the negative side of things, I should say that I enjoyed this one far more often than not. It’s funny, it’s clever, it’s original in a lot of its storytelling approach, and the cast is generally quite strong. I’m going to give it a light 8/10, and a recommendation. Even if I’m not sure it sets us up for the last movie on the right foot, it still succeeds on its own merits. And it’s far too interesting and unique for people not to see. So go enjoy it, and may the Force be with you. Okay, I didn’t read all of it, mainly cause I havn’t seen the movie yet, but your an amazing writer. Thanks for the kind words. The bottom line without spoilers is that yes, you should definitely see the movie. It’s too thought-provoking and entertaining not to, and even though it’s become very contentious with some fans, I’d say that just makes it more important for everyone to see and reach their own conclusions.